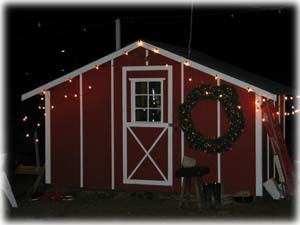 Choose and cut your own Christmas tree in the old tradition at George’s U-Cut Tree Farm located in Azalea, Oregon. We offer beautiful Douglas-fir and Grand fir trees. Notes: Trees are measured to the sheared tip. We have a limited number of saws available so it would be best to bring your own saw. At I-5, Exit 88, turn towards Azalea/Galesville Reservoir, bear Right (East) onto County Road 36 (Upper Cow Creek Rd). bear Right (East) onto Starveout Creek Road – Arrive 1076 Starveout Creek Road, Azalea, OR 97410.